A good, rear-drive Alfa Romeo saloon has been a long time coming, but it’s finally here in the Giulia. Good enough to beat the BMW 3 Series and Jaguar XE in diesel guise? The Alfa Romeo Giulia has been such a long time coming that there’s no little irony that I’m stuck waiting for it now. Stuck in the office, staring at the ceiling. Waiting and staring. How long have I been waiting? Well, it has been five years since the Alfa 159 dropped, old and unloved, off a production line cliff face. But it represented only part of the waiting period, not its beginning. Before that, there was the 156 and the 155. Both were pretty. One was good. Neither, though, was the front-engined, rear-wheel-drive saloon that we felt Alfa should be building if it wanted to be Italy’s BMW and a proper volume contender. No matter that it hadn’t actually built such a car since Fiat massaged the ailing brand into Lancia in the mid-1980s. It would, we felt sure, be like riding a bike for the evocative brand. Muscle memory would take over. Turin itself needs no help locating the right kind of inspiration; the name Giulia, after all, is an homage to precisely the kind of model we’re talking about. The four-door Type 105 of the 1960s was the sort of car that made Alfa rightly famous: a swept-back, featherweight saloon coupled to the firm’s fantabulous Twin Cam engine via the medium of a driven back axle. The original Giulia sprouted memorable add-on trim names: the TI Super, the Nuova Super – each shifting quickly for their day. A day that ended in 1977. Forty years is a long time for the spirit of a car to flutter about in the ether – long enough to excuse a morning spent waiting in the office for its namesake to be whisked from the dockside to Autocar’s second home under Heathrow’s flight path. At least the Giulia’s rivals have turned up. One is the standard, the other its successor. In the marine blue corner is the current BMW 320d, hewn over time like a Neolithic arrowhead and implacable, brilliant evidence of what Alfa should have been doing and then patiently fine-tuning all this time. This one is our long-term test car, and the fact that it is dirty and has an xDrive badge on the back only confirms my affection for its attitude and flint-edged purposefulness. In the plum red corner is the car fashioned from the ground up to beat it. The XE is a very British, very Jaguar creation. It’s tempting to think of it as the culmination of a journey that began with the demise of the X-Type, but that would lowball Jaguar’s current trajectory. Better instead to acknowledge its finer points as a marker of remarkable progress – and the good bits of the Ingenium-engined, aluminium-underpinned XE are exceptional. Certainly, it is Jaguar galloping forward on self-belief, conviction and talent and gunning not just for recognition but heaps of buyers, too. It is Jaguar as Alfa would probably like to see itself: Europe’s emerging premium powerhouse, nourished by its long heritage yet now emphatically aimed at profitability. The XE, too, in this particular instance, is all-wheel drive. It can be had with four-wheel drive because you can have the 320d with fourwheel drive. You cannot have a Giulia with four-wheel drive – which makes the second irony of a cold, contrary morning the fact that Alfa’s first rear-drive car in forever has to take on the best of its rivals with one less driven axle than either. If anything, though, that’s merely symptomatic of the mountain it has to climb. There is a phalanx of other factors – the look, the interior, the build quality, the engine, the refinement, the ride, the chassis, the practicality, the price and the prestige, each already deliberated by the competition and meticulously moved towards approval. Alfa’s ability to behave likewise – to formulate the right list and properly scrutinise it, to achieve a rich and harmonious balance and the impression of no compromise when there have been hundreds along the way – will be at the core of the Giulia’s comparative success or failure, just as previous neglect was at the nub of the Mito’s and Giulietta’s relative mediocrity. That’s an expansive thought for so early on a Wednesday. But a good one for a long wait. The fourth decade concludes just after 9am, with our protagonist’s entry from stage right. The Giulia is white and in the continental equivalent of mid-range Super trim. It is low slung and crisp – neater in the shoulder line than the long-decked XE and not nearly as sinewy as the 320d. It is not precisely pretty, nor does it fulminate with raw presence, yet it is sleek and stands out on a grey day not just on the basis of its newness, but also by the virtue of that eagle-nosed prow and its fetching alloy wheels. It looks like an Alfa, from a distance and while you’re standing next to it, waiting impatiently to be handed the key. Inside, in the opening threesecond gambit where your eyes decide whether you like a car’s cabin before your brain actually debates its objective merits, the Giulia scores big. It is tremendously handsome – made to seem all the more elegant by the seductive swoop of the dashboard, functional by the large, accentuated dials and spacious by the breadth of the centre console. More than one feature – the circular vents, the metal pedals, the two-tone trim, the flush infotainment screen – seems to have been chosen based on prettiness, a compelling notion in the taskfocused world of compact execs. 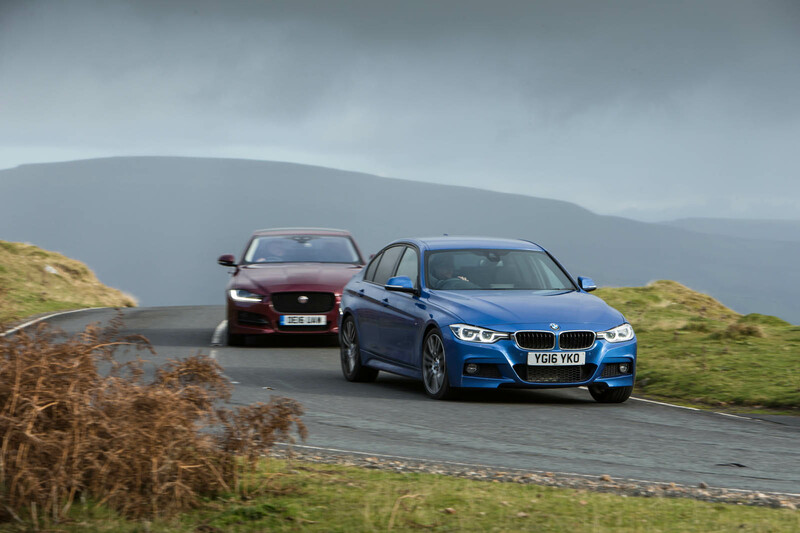 The XE and the 3 Series are gloomier, steadfastly monotone and more obviously in thrall to orderliness by comparison. But they are both better made, more indulgent of fingertips and generally easier to use. The 320d, in particular, even in the twilight of its life cycle, is a sonnet to good sense and the tactile fulfilment of making the steering wheel, gear selector and switchgear pleasing to hold or touch. Its master stroke, though, is the tried and tested iDrive, the infotainment template imperfectly copied by Alfa in the Giulia. Superficially, ripping off BMW’s operating system seems like an easy job but, as ever with these things, the unseen code needs umpteen attempts at fettling before it runs smoothly, and the sluggish Connect set-up feels like it’s only on version three. It is unaided by the display, which is too extravagantly widescreen for its own good and well short of the number of pixels needed not to look low rent to smartphone-touting buyers. The controller is less than pleasant to use, too (there should be no play in it whatsoever, Alfa; it should rotate like its mechanism were made of rhodium) and so is the gear selector, which, for all its shapeliness, feels too rudimentary in its plodding shunts between P, R and D. Jaguar’s rotary gear selector and all-new touchscreen feel about a decade ahead. The interminable wait over, there’s now 150 miles of interminable motorway journey between us and Brecon to get to know the Giulia. Of those 150 miles, the car needs no more than three or four to announce itself as a serious dynamic rival to the competition. It’s not just that it is good; it’s that its goodness is so apparent that it seems incontrovertibly black and white from the get-go. I didn’t expect to like the steering. Rumour had it that it was too light and the rate of response too abrupt. But I swiftly bonded with it. Yes, its resistance is feathery – especially next to that of the BMW and Jaguar, which change lanes with the meaty assurance of steering a boat onto a slip – but it doesn’t rile you with electric hollowness. Instead, it feels as if there’s marrow in there somewhere, metering out authenticity and conviction in the direction changes and rewarding you for attuning your inputs to its delicacy. The ride is even better. The rudimentary, twangy memory of Alfa’s hatchbacks is dispelled by the studied bump modulation and forthright poise of the Giulia. It’s firm, yes, but even on optional 18in wheels and run-flat tyres it strikes that rarefied strata of compact exec pliancy head on, telegraphing topography from each corner while on the motorway but never letting any of the information unduly upset the super-rigid passenger cell. 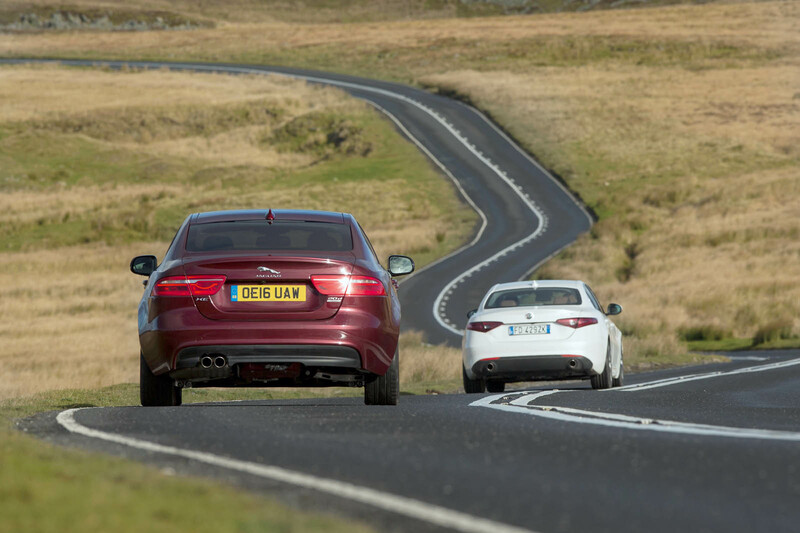 Sure, the BMW and Jaguar do an even better job of cosseting, being noticeably quieter and, in the XE’s case, spectacularly adept at wheel control. But the early interest piqued by the Alfa’s pointy, frothy ensemble hadn’t faded by Reading – nor Swindon, nor Bristol. Equally implicit in all the fizz is the Alfa’s new 2.2-litre Multijet diesel engine. In its more powerful, 178bhp guise, it’s a peach, delivering all manner of gravelly zing to the back wheels. 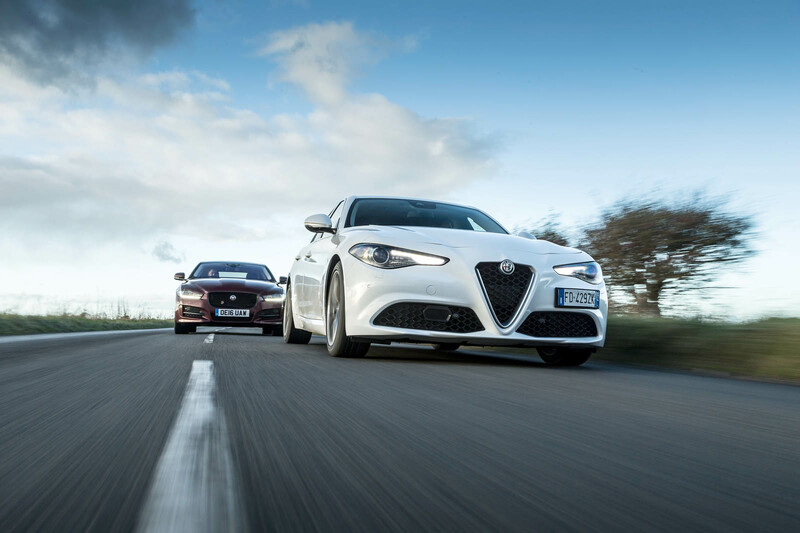 There’s no question that the Giulia is manifestly the quickest car here. Ostensibly, it’s because the all-aluminium Multijet dishes out more peak torque than its rivals and does so through an eight-speed automatic gearbox that seems programmed with a bit more relish for downshifting. Really, though – or more so, at any rate – it’s because the Alfa’s two-wheel-drive identity affords it a 165kg saving over the competition – and the advantage crops up everywhere, not least when we leave the motorway behind and emerge on the sunlit uplands of the Brecon Beacons. 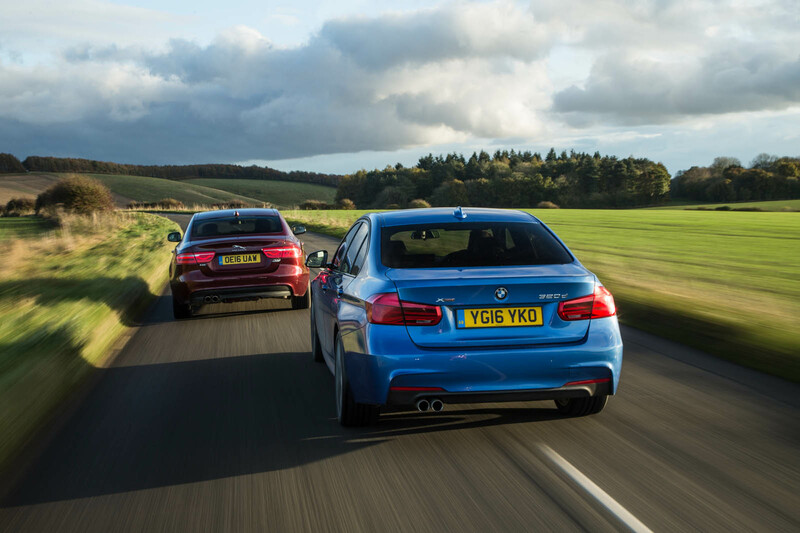 The B4560 suits the 320d. Its corners are sweeping but for the odd tight squiggle to keep things respectable. The BMW still feels sorted to its core. It steers with rigour, goes categorically where you aim it and turns irresistibly around its centre. 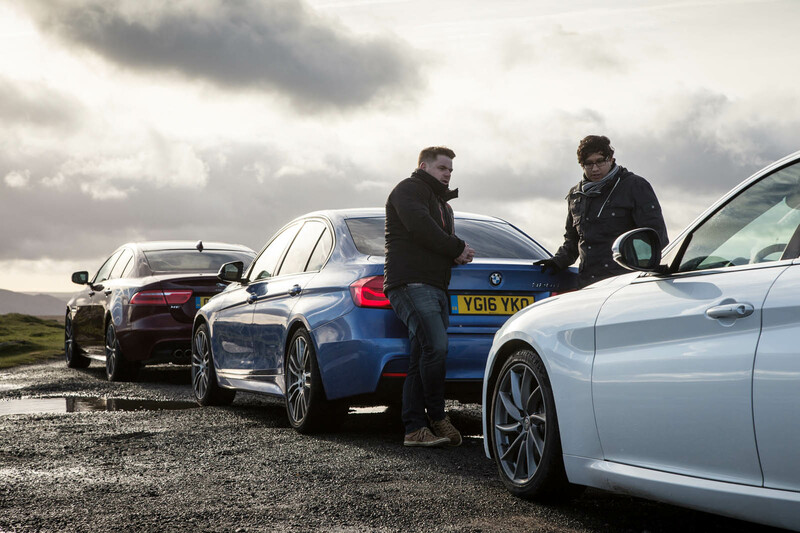 It is easily accomplished enough to make driving it briskly seem less like a challenge and more like its default state, as though BMW has pre-conditioned the car for its stereotypically thrusting customer base. But consider it more carefully and mostly everything it does is about deeply satisfying a dynamic urge to take each new corner a little higher up the tinny rev range of the 188bhp 2.0-litre lump. The rearbiased xDrive chassis, while less agile than the Giulia, rewards confident inputs with tenacity and the viscous sweetness of a sucked Polo mint. Because the Jaguar’s body movements are more stately than the 320d’s, it’s tempting to frame it as the warm bath of the trio – something to slip into while you bob about contentedly on the ebb and flow of its plush primary ride. But that’s reductive. In fact, the XE’s control weights are just so well tuned that you half-forget you’re applying the physical effort needed to drive it at all. The steering doesn’t shoulder its way into your consciousness with the BMW’s heft or the Alfa’s rate of response. You just turn the wheel and the car responds. Any impassivity at this point can be blamed (again) on the weight associated with the driven front axle and the 178bhp 2.0-litre Ingenium engine’s reluctance to shift it quite as rapidly as the 320d does – but the Jaguar blends its extra traction seamlessly into its progressive and engaging response and will indulge you whether or not it’s a toe or an entire torso being dipped in the experience. In the Alfa, I hardly need to go digging at all. It does what it has done all day: be a little bit faster, a little bit flimsier, a little bit noisier, a little bit firmer, a little bit more fun and a little bit cooler. That it gets across Brecon marginally quicker than its rivals should not be thought inconsequential. It not only reinforces the idea of the Multijet’s striking performance but also underlines the daintiness and diligence of a front end that does without its own supply of torque. The Giulia’s turn-in, even in the slow corners you’d expect to favour its rivals, is both terrifically incisive and impressively resistant to understeer. Alfa’s claim of 50/50 weight distribution never seems a percentage point less than accurate. All of which feeds in to the idea that the Giulia is not only a little bit more animated and a little less constrained by weight, but also that it better resists the apparently necessary level of benign sediment that settles on its rivals. Does this ultimately lift it above them? Well, it comes tantalisingly close on Brecon. Likewise later, as I look back on the contest in retrospect. The lightness, the flatness of its cornering stance, the damping, the front end and the steering remain embedded in the memory, evoking the same sense of excitable completeness that BMW and Jaguar seemingly evoke without effort. For Alfa Romeo, it is a staggering long-jump leap forward and embedded in the sternum of everything the Giulia does well. It’s almost churlish, then, to peg it back with ‘but’, ‘however’ and ‘were it not so’, yet the broader picture is admittedly less absorbing. Alfa’s oversight still slips when it comes to marshalling how well put together the car is, how it functions in a mundane switch-flicking way, how quiet it ought to be when subjected to wind flow and just how important infotainment is to the way buyers regard almost any product on four wheels. In this regard and a few more besides, both the 320d and XE romp over the Giulia. Nonetheless, to apply the standard modern Alfa adage – that there’s a great car here waiting to get out – is similarly unfair. The Giulia is already great and only awaits the attention to detail that may yet deliver a class leader. Improbably, it fully merits our continued patience. FCA is not yet capable of competing BMW and Jaguar even without lomg range reliability testing. It is saddening. Oh please just shut up already will you? My sister in law bought a brand new 320i, and after 30,000km both her turbos packed in. LOL! A 320i with twin turbos as standard?! This is lazy dogma. Alfa. whilst not the market leader (neither are jaguar or BMW) has done a lot to improve reliability. In last years Driver Power survey of 50,000 owners Alfa ranked above Nissan and Volkswagen. the BMW Mini was in last place.. maybe the need to consider some long range reliability testing..? BMW also placed 21/24 in JD Power.. not the best position from which to try and make a point really, eh ? I'm not entirely convinced that the Alfa is somewhere to place my money. I can see enthusiasts liking the car and selling to them, but let's not kid ourselves - this is now a fleet market driven by sales to the user chooser and then onto the likes of me 2-3 years down the road. How many buyers will actually be swayed by the interior and how many by how it drives? How many buyers will actually be swayed by (Giulia's) interior and how many by how it drives? I'd eliminate the other two cars on account of their interiors - the BMW a cacophony of curves and shapes, the XE more a mediocre & unimaginative student's design exercise than a finished design. There is always the accomplished C class interior. But the C class (which promises ride comfort) is not even featured here. Has it already been eclipsed? I agree - the interior of the 3 is a mediocre effort - on the used market there's not a great deal of difference in price between a 520d msport and a 320d msport and if I was going for a BMW I'd probably go for the 5. A4s and C Classes are very nice places to sit although running a used Merc can be a very costly proposition. The Alfa's interior is actually simplicity personified, everything you need and nothing you don't, all important controls easily at hand. And it's chassis is simply world class, as you've read here, and I've read in numerous other rags. Your prejudice still blinds you.